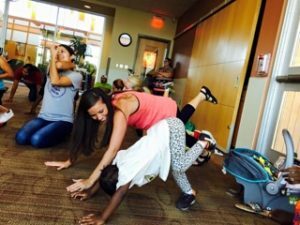 Partnering with Oklahoma City Educare, a program of Sunbeam Family Services, Family Fitness Nights seeks to increase health awareness in students and families and create meaningful opportunities for families to connect with each other and other families. Junior League volunteers lead the children of Educare and their families through various fitness and health-related programs and activities. Sample topics include safety and injury prevention in physical activity, healthy and new food choices, dental health, and effective activities to “get moving.” Volunteers also teach children and their families how to make healthy snacks.